The following study was conducted using of a dietary supplement called DuoVital, manufactured by Gramme-Revit GmbH. DuoVital is a dietary supplement containing hyaluronic acid and chondroitin. The trade name - Duo-Vital is the trademark of the product used on Asian markets. Product HYALUTIDIN HC Aktiv is the trade name valid for the Polish market. Both products have the same chemical composition. In order to conduct the intervention clinical research on the effectiveness of DuoVital complex containing hyaluronic acid and chondroitin as complementary therapy, the group of patients with the limitations of motor function due to the structural damage to the knee was examined. All patients underwent arthroscopy. The study was performed before and after treatment in the randomized control groups. The WOMAC pain questionnaire was used as an assessment tool. In order to compare the individual periods of study, the total points were counted using the WOMAC scale. In the following part of the assessment it was determined whether there were any significant changes of points with respect to the average values of the group. As a result of comparing the experimental group with the control group in all studies, the significant differences between groups were reported. The participants of the experimental group who received a dietary supplement containing hyaluronic acid and chondroitin in addition to surgical intervention , reported significantly fewer limitations of motor function after arthroscopic surgery in comparison to the participants of the control group. In the experimental group, the reduction of pain was also more effective. 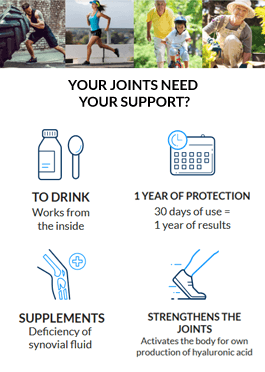 The conducted study has shown that in case of the trial participants of experimental group there is a statistically significant effect of a dietary supplement containing hyaluronic acid and chondroitin on pain reduction. Therefore the conclusion may be drawn that the combination of treatment in the form of arthroscopic surgery and the concurrent administration of the hyaluronic acid and chondroitin supplement gives better results in terms of pain relief than the arthroscopic surgery as the only form of treatment. The application of the above mentioned dietary supplement can thus be regarded as a legitimate complementary treatment in surgery. Patients were reported to have cartilage degeneration [ 3 ] of the first stage in the form of surface cracks and fissures and the softening of the cartilage, as well as the cartilage damage of the second stage and a maximum depth of lesion less than 50 % of the thickness of the cartilage layer (Table 1). In addition to the hyaline cartilage degeneration , the fibrous cartilage damage was also found.